Just a short report from last Sundays sailing 18th for the Blog site please. Beautiful sunny morning, must be the calmest water we have ever had. Access was easy as the car park barrier had been removed. We had about 10 members all sailing a variety of craft in all shapes, power and size combinations, from pursuits to sailboats. Regarding sailboats, the sailing club, true to their word, have re fixed the jetty which makes launching long keel boats easy again. First time out for my Lynx and handled the water with ease even the waves from the wake off the ski boats causing no concern. for sale from my friend Mick Searle. 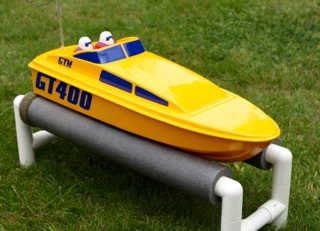 It’s a George Turner model 17ins long approx, fitted with a 400 brushed motor. Included is a speed controller and steering servo. Just requires a receiver and battery. Very fast and great fun. Micks guide price is £30 or make him an offer! If you can put it on the web site it would be great. If anyone is interested I will put them in touch with Mick or speak to him for them. IF any of our club members are interested, either speak to Phil direct, or contact myself [club sec], as for security, I wont list phils details on this site.